The UK’s 2016 Little Rebels Award shortlist has been announced – and once again it sets a challenge for the judges… It presents a good mix of books for all ages. There are some big names among the books’ creators – and notable is Gill Lewis’s Gorilla Dawn, as Gill won last year’s award with her book Scarlet Ibis and this is her third book to be shortlisted overall; and The Boy at the Top of the Mountain is also the third book by John Boyne to appear on the Little Rebels shortlist. Michael Foreman is on top form with Origami Army; Michael Rosen is inimitable and as funny as ever; Henry Finch offers young readers a glimpse at how to stand up and be yourself (and who can resist Viviane Schwarz’s thumbprint birds? ); and I’m a Girl is a joy for boys as well as girls. Yes, the judges have their work cut out! I’m a Girl! by Yasmeen Ismail (Bloomsbury Books, 2015), in which a girl who likes doing ‘boy’ things gets mistaken for a boy – and makes friends with a boy who likes dressing up as a princess. Definitely a gender-stereotyping-buster – and buzzing with joyous energy, thanks also to the vibrant watercolour illustrations. I Am Henry Finch written by Alexis Deacon, illustrated by Viviane Schwarz (Walker Books, 2015), about a bird who stands out from his flock to be a named individual with dreams and ambitions…. A beguiling introduction to thinking—to philosphy; and the illustrations are, as I said above, irresistible. The Little Bookshop and the Origami Army by Michael Foreman (Andersen Press, 2015), an imaginative and visually delightful (I have always loved Michael’s signature blue!) 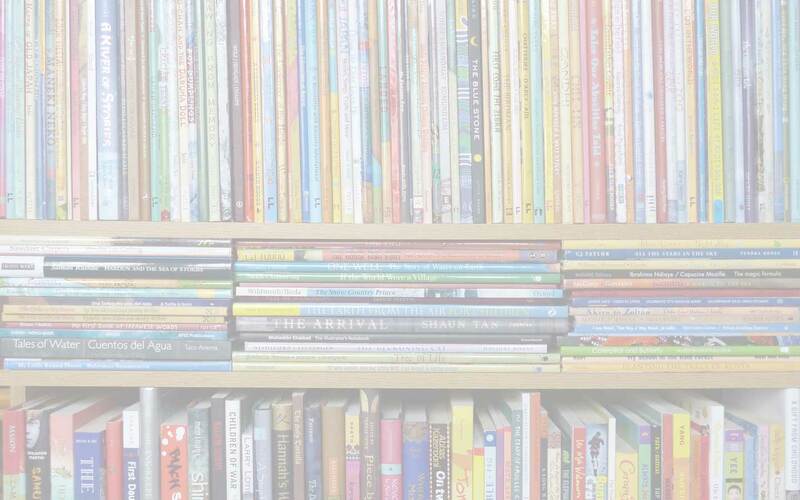 take on the salient topic of fighting to keep a local bookshop going. Definitely one for firing up young minds to action in the interests of defending small, local businesses from annihilation and how communities can make a difference: all thanks to superhero Origami Girl! 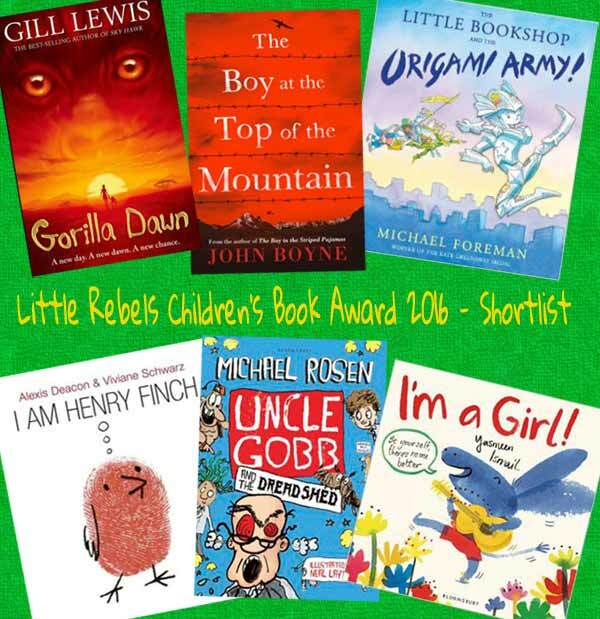 Find out more details about the shortlist from the Little Rebels’ website, as well as more about the award itself. The winner will be announced at the London Radical Bookfair on May 7th 2016 at the Alliance of Radical Booksellers’ new fair venue, Goldsmiths University. Follow the fair on Twitter at @ARBRadBookfair. The event is free and open to all. If you decide to buy any of these books, the organisers ask that you consider supporting the Little Rebels Award, and also its sister, adult, award Bread & Roses, by purchasing them from either the award administrators Letterbox Library (who will be offering a discount on these books between now and June, and who stock a treasure trove of multicultrural books generally) or another Alliance of Radical Booksellers member where possible. Alexis Deacon, Alliance of Radical Booksellers, Andersen Press, Bloomsbury, Gill Lewis, Gorilla Dawn, I Am Henry Finch, I'm a Girl!, John Boyne, Letterbox Library, Little Rebels Award, Michael Foreman, Michael Rosen, Neal Layton, Oxford University Press, The Boy at the Top of the Mountain, The Little Bookshop and the Origami Army, Uncle Gobb and the Dread Shed, Viviane Schwarz, Walker Books, Yasmeen Ismail. Bookmark.